Help the Smithsonian solve a mystery the infamous Megatherium Club left behind for future explorers. Targeted at teens, this game allows you to spend an hour with your friends or family investigating the Castle, solving puzzles, and following clues hidden by these mischievous former inhabitants of the Castle! Must be 13 years or older. Many scientists lived in the Smithsonian Castle in its early years. These four young naturalists lived in the building and often collected for the Smithsonian on expeditions to new territories of the U.S. in the mid 1800s, and then lived in the Castle while they cataloged their specimen. 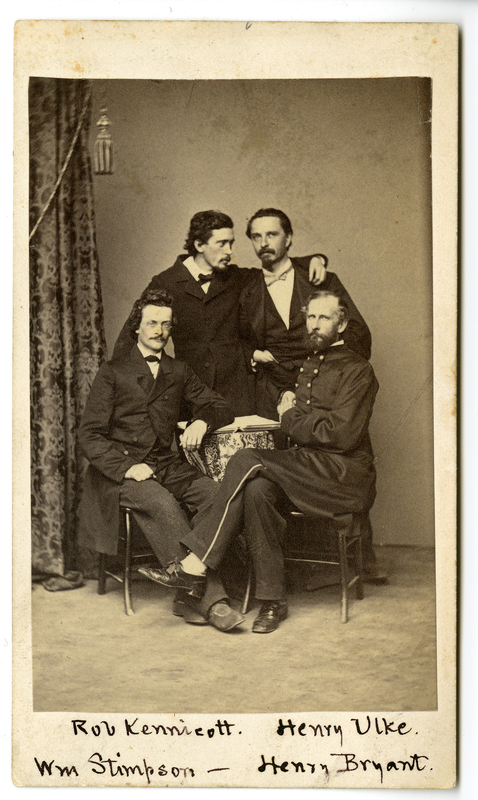 Pictured clockwise from upper left are Robert Kennicott, Henry Ulke, Henry Bryant and William Stimpson. They dubbed themselves the "Megatherium Club" after an extinct giant sloth that had been recently discovered. Explore like the Megatherium Club! Hear the Smithsonian’s historian, Pamela Henson, describe the real Megatherium Club, a group of rowdy naturalists living in the Castle in the 1800s, Smithsonian Mobile Site. Listen to the Smithsonian’s Sidedoor Podcast, first episode of season two “If These Bones Could Talk,” on Robert Kennicott and the Megatherium Club. Learn what the Smithsonian’s forensic anthropologists discovered when examining the bones of Robert Kennicott, a key member of the Megatherium Club, who was thought to have died by suicide while on expedition in the Yukon (courtesy of The Washington Post). Visit Robert Kennicott’s bones, as well as specimen he collected, at Objects of Wonder, Smithsonian’s National Museum of Natural History! Funding generously provided by the Smithsonian Women’s Committee.